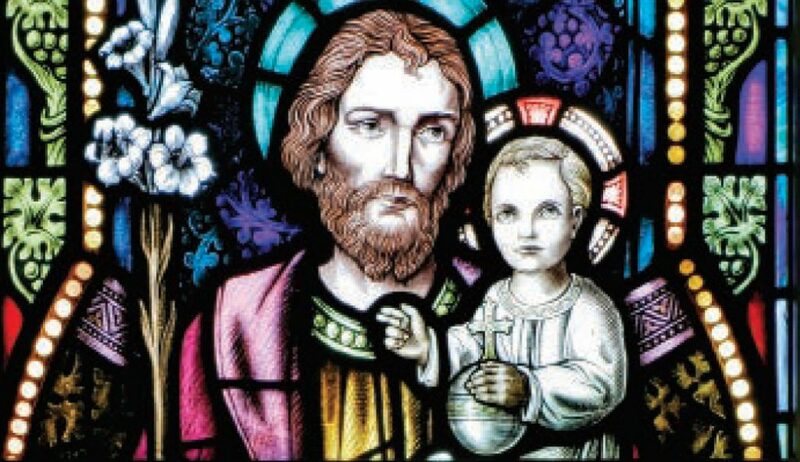 Just as God the Father selected the Blessed Virgin Mary to be the mother of his son, he also chose St. Joseph to be Mary’s chaste spouse and Jesus’ foster father. As the head of the Holy Family — the model for all families — he is also the inspiration for and the protector of all fathers. St. Luke’s Gospel tells the story of Christ’s infancy from Mary’s perspective, while St. Matthew’s Gospel gives us the story from St. Joseph’s point of view. He is introduced to us as a just man, a descendant of King David, a native of Bethlehem, a carpenter living in Nazareth and engaged to Mary. After the Annunciation, when Mary told Joseph she was pregnant, he resolved to break off the engagement privately. Under the law of Moses given in the book of Deuteronomy, if Joseph had made a public charge of infidelity against Mary, she would have been stoned to death. Before Joseph could do anything, however, God granted him his own annunciation. An angel of the Lord visited Joseph in a dream, urging him to take Mary as his wife, assuring him that the child she carried had been conceived by the Holy Spirit. Joseph must have died before Christ began his public ministry. If he were still alive, he would have stood with Mary at the foot of the cross and there would have been no need for Jesus to entrust his mother to St. John. His feast days are March 19 and May 1.